In the US we are used to giving our credit cards to the server as a part of the tradition of paying at a restaurant. Ultimately, we are comfortable in this ritual, yet it has some major flaws. First, when the card leaves the table, physical card security could be compromised. As a consumer, we have no idea what happens with our cards once they are out of our hands. It could be skimmed electronically, a restaurant employee could write down the card number and the CVV so they can commit CNP fraud or the server could even shop right then and there from their mobile device using the credit card information. The reality of these attacks is that: 1) they are nearly impossible for restaurant operators to stop, and 2) even isolated incidents can impact the restaurant’s reputation. Pay-at-the-Table solutions immediately eliminate card skimming since the smart terminal is brought to the consumer to pay and the card never leaves their possession. Another challenge restaurants face is the speed of service and its effect on consumer satisfaction. Presenting a bill and a Pay-at-the-Table smart terminal simultaneously to the customer eliminates the round trip travel time from the table to the POS. Studies have shown that the average time it takes to pay a check in our traditional method is eight minutes. This is the time from when the check is presented to the customer, to the time it takes the servers to walk back and forth with the card and receipt from the POS system for the customer to sign. As you can see, the total time is almost completely dependent on the server’s availability. The restaurant industry has realized this challenge and combated it through empowering managers to facilitate the completion of the ritual and through the implementation of technology like table top payment solutions. With Pay-at-the-Table, consumers are in charge of their own checkout experience and can proceed as fast or as slow as they desire. In today’s processing environment, branded debit cards can be used to pay for meals. However, the holds on funds are not generally released until settlement and they can have a significant impact on consumer satisfaction. 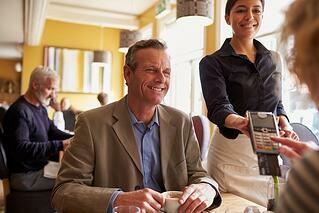 With Pay-at-the-Table, the restaurant owner gets two notable improvements. First, the transaction mechanics behind the scenes are different. For EMV-enabled debit cards, there is no auth/capture transaction pair sequence, which allows merchants to authorize a payment amount at the time of checkout and capture the payment, including tip, at a later time. Second, restaurant owners can offer use of PIN debit to their diners. Most consumers understand that PIN debit is a safer payment technology and the facilitation of PIN usage eliminates stolen card chargebacks. The transaction flow change mentioned above can also have an impact on other chargebacks. Today some issuers will automatically chargeback transactions which have a tip more than the highest allowed for total bill amount (e.g. 25% or 30%). In some restaurant environments, tips are routinely higher than these allowed amounts and the operators spend a great deal of time and effort in fighting these chargebacks. Restaurateurs and their desired uses for technology are rapidly changing. To that end, we will see more opportunities for operators to engage with their clientele using new modes of communication. This will initially take the form of extending Pay-at-the-Table solutions to enable loyalty enrollment and credential sharing as well as other basic couponing, marketing, and guest satisfaction activities. As the device form factor changes and the technologies behind them change, the ability to excite and delight a restaurant’s customers through engagement technologies will expand to places which only a few people currently envision.